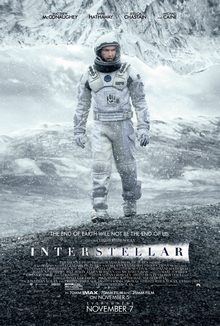 Even after halfway into the movie, it felt like a science-fiction expedition that is straightforward to follow, until such a moment came, and the final hour of the film was all Christopher Nolan. Another magic made yet again, and though the movie felt a bit too long, there was no minute where I wish I was somewhere else. It's hard to talk about plot here, and I seriously do not want to spoil anything. But just know that the first half of the movie was very easy to follow, before taking a leap, and towards the end, it's all Christopher Nolan once again, and you find yourself piecing all that you have known together to make sense of the movie. The visuals are breathtaking. And I'm especially in awe of the effects they made on the wormhole, with colourful dazzling effects and the bending of the space. It certainly was a wonder to behold. There certainly wasn't much more of spectacular visuals, but it came into place in every scene brilliantly, be it in outer space or in other planets. And the other thing that left me in awe is the music. Not just in awe, but in chills. Hans Zimmer conceive such a brilliant piece of theme that is now stuck in my head, and probably for days to come. Even more brilliant, is how it came to be, so I would like to share this: http://www.businessinsider.sg/how-hans-zimmer-wrote-the-interstellar-theme-2014-11/#.VFzOEPmUcXc. The core of the story being the relationship of a father and a daughter makes for a powerful piece of drama, and several times I feel the emotion so deeply. I almost cried at one point of the story, because how the story is set out is brilliant, and touching in the heart. Full credit to a number of the cast who I can't praise enough. Matthew McConaughey was unbelievable! He should win another Oscar for this. From his crying, to his anger, to his calmness...brilliant! Young Mackenzie Foy was the surprise of the lot, she was amazing as young Murph being left by her dad. Yet everyone else is great as well, Jessica Chastain, Anne Hathaway, and of course Michael Caine...perhaps this is one of the most perfect cast ever assembled. There is only this slight matter of pacing, in which certain parts of the film could have progressed faster than it was. So it does feel quite long, but there was never any minute where I wish I'd rather be somewhere else, because the world, the characters are worth investing for. There was great humour along the way, which made the journey even more pleasant. The robots TARS & CASE were great, and provided some extra humour & drama too. There was almost no proper action sequences, but it was never the intention of the movie, and I wouldn't expect it either. But the suspense throughout, especially under the constraint of resources was intense. And, there was never any doubt on the directing part, is there?